Venetian Works of Defence Between 16th and 17th centuries: Stato da Terra – Western Stato da Mar are 6 fortifications along the Adriatic Sea that date from the historic Republic of Venice. They represent the evolution of Venetian military solutions and their innovations in architecture and methods. In the whole, they created a defensive line that guarded the Venetian commercial network. In Zadar, the Venetian TWHS is a separate area from the Roman TWHS: these walls, fortifications and related buildings are located on the fringes of the historical town. They were constructed in 1472 to separate (and better protect) Zadar’s peninsular (Roman) core from the mainland. The defence works are still very prominent, except ironically at the sea side where they were destroyed and the Roman Forum was brought to light, the focal point of Zadar's other nomination. The various gates around town have small parking lots, where I was able to find a space and explore the town on foot from there. The most interesting area is the Grimani bastion (now a night club) and the adjoining citadel tower of the Great Captain. When you go to the outer side here, you’ll be in front of without a doubt the major point of interest of this defence system: the Landward Gate or “Porta Terraferma”. It was designed by the famous Venetian architect M. Sanmicheli. The overall setting reminded me a lot of Corfu. Zadar already does attract its fair share of tourists and even in November when I visited, there were numerous other visitors. The town this year already has secured one honorary title: the town hall featured a large banner displaying “Zadar elected European Best Destination 2016”. The Michelin Green Guide for Croatia gives it 2 stars (worth a detour), which seems rather generous. I found it pleasant enough, but had seen all components of both TWHS ánd drank a cappucino on a terrace with the locals within 1.5 hour. Although it must be said that I was visiting on Sunday morning, so for example I wasn’t able to visit the interior of churches like the St. Donatus. I visited Bergamo in November of 2018, focusing on the city as a whole, which afforded me the opportunity to take a look at the fortifications that are part of this serial site. I frequently profess my admiration for the feats of human ingenuity, but walls around a sizable city are hard to get really excited about. In the back of my head I can acknowledge their scale and impact in the context of the times that they were built in. Visually, it’s just really thick and old walls, with an occasional portal livening up the scene. So, the time I spent on admiring them was not too extensive, just enough to support my claim of having visited the site. 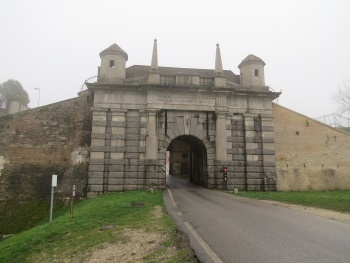 The erstwhile main city gate of Porta di San Giacomo is a pretty good location for a quick survey of fortifications. The gate itself is quite impressive. If you are so inclined, you can walk the length of the walls and stop by a couple of other entry points to the historic part of the city, which I estimate can take around two hours. Additional fortified layers can be seen in some interior parts of the Upper City as well. My travel plans will take me to Croatia this year, so I will be able to extend my coverage of this site. Maybe even doing it more justice. One doesn't have to look any farther than the city walls of Kotor in Montenegro to see they are part of the Venetian Works of Defence Between 16th and 17th Centuries World Heritage Site. On the wall near the Maritime Gate to the city is a carving of the Lion of Saint Mark, symbol of the city of Venice. Above the city walls are fortified defenses snaking up a mountainside to the Castle of Saint John. When I visited Kotor in October this year, my first goal was to hike the fortifications to the castle for a view of the old town and the bay. There are many steps and switchbacks along the ramparts leading up the mountain, but there are also ample opportunities to stop and enjoy the views. Somewhere around a third of the way up the mountain is the Church of Our Lady of Remedy, which is small but scenic. From the church, the castle with ravens circling overhead looks deceptively close; it is not. Once I reached the fortress, however, I was rewarded with views of red-tiled roofs of the old town of Kotor and the beautiful Bay of Kotor. I highly recommend the hike for anyone visiting Kotor. 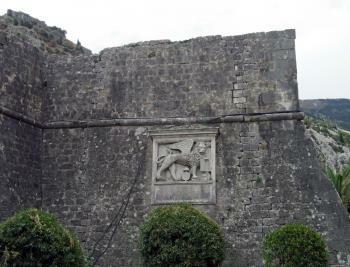 Logistics: There are at least two entrances to the fortifications found at the back of the town of Kotor; there is a small fee for entrance to the fortifications. The Fortress of St Nicholas outside Sibenik in Croatia is probably the most decrepit WHS I have visited. Not in the sense of simply being a ruin, but in that it feels entirely abandoned, with no significant attempts at developing it for ‘safe’ tourism. This will probably change over the next few years. The general area seems to be a reasonably popular picnic destination, with a newly constructed EU-funded walking trail along the coast allowing for an easy afternoon walk from the car park, but few bother to actually go inside. This is understandable, as there are two ways to manage this, neither of which are especially practical. 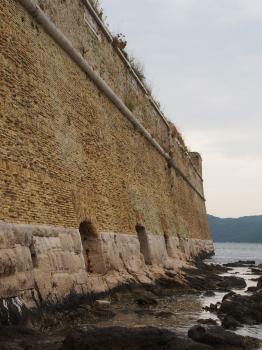 Firstly, from the land-side, there is a long wooden plank leading up to a hole in the fortress’ upper walls. This plank is held in place by a rock, and only manages to get halfway up to the entrance. From there, there are two half-metre pieces of timber with footholds loosely nailed to the side that you pick up from the ground and place precariously on the end of the long plank. As there is nothing to really grip onto while you’re up there, given that the wall itself slopes smoothly outwards in a bulge, this felt unsafe, so I did not manage to enter this way. Working together to support and hold each other, a group of three men achieved this goal, so it is not impossible. Instead, however, there is a sea entrance around the east side, closest to Sibenik. With a boat, this entrance would be simple, but I am not sure where or if boat tours are actually offered. Therefore, the decision was made to swim to this entrance, much to the shock of local picnickers. In practice, however, the fortress has a stone ledge surrounding it that ensured that it was possible to walk around the edge with the water never getting more than mid-chest height. Without a good grip and balance, however, it would be easy to slip and fall into water that required genuine swimming. The molluscs that covered the ground were a little painful, but did not cause any cuts to my bare feet. The interior of the fortress showed some signs of work being done to stabilise the structure, but still felt abandoned. The views from the roof were impressive, and the metal remains of cannon positions were surprisingly intact. The interior is mostly a series of empty rooms requiring a torch to properly explore, with little indication of what they once contained. In the largest room, metal grates have rusted away, granting access to the exterior of the fortress walls on the ocean-side. A taxi from downtown Sibenik cost us about 90 kuna one-way. We planned to walk back, but this turned out to be a lot more strenuous than we had expected, so is not recommended. Bicycling each way is a plausible option, but rental was too expensive for our budget, and we didn’t want the pressure of taking longer costing more. In terms of impressive physical remains, St Nicholas Fortress is maybe not the best example within this serial WHS, but the sheer adventure of exploration and its unusual location make it highly memorable. I visited this transnational WHS mainly in April 2014 (Croatia and Montenegro), in August 2013 (Bergamo, Italy) and countless times but specifically after inscription in July 2017 (Peschiera del Garda). 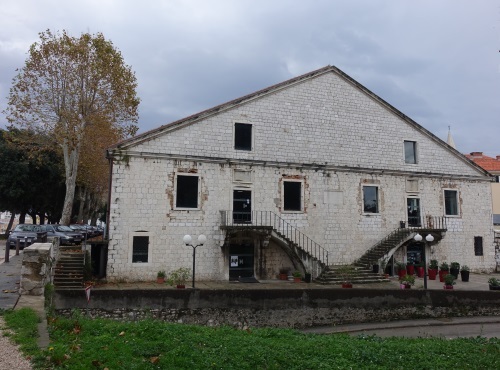 I still cannot understand why Hvar, Croatia and mostly the Venetian fortifications near Venice itself have not been inscribed (perhaps they will at a later stage with an extension). The Fort of St. Nikola is on the outskirts of Sibenik and is worth visiting if you're in the area. 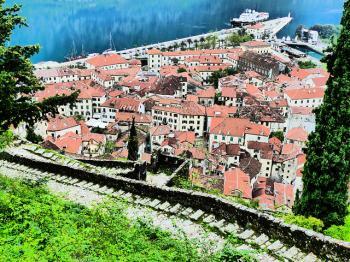 The fortifications of Kotor are by far the most impressive both at street level but especially if you climb to the top. The Castle Of San Giovanni offers incredible views not only of the fortified city of Kotor (photo) but also of the inscribed Bay of Kotor. In Italy, I visited Peschiera del Garda practically every other summer weekend since I was a child but I revisited specifically after inscription in July 2017. It is a pleasant fortified town by the Lago di Garda but I would never have imagined that it would make it to the WH list. The same applies to Bergamo which I visited en route to Crespi d'Adda. I wouldn't mind visiting Zadar and Palmanova in the future to complete all inscribed locations but it will have to be a combined visit with another WHS so it won't be any time soon I'm afraid. I visited the two north italian sites in 2014. Luckily, they are close together and can be combined easily. Bergamo is a very beautiful city by itself. The old city sits on top of a hill, with the city walls all around, lots of medieval towers in the middle and the alps in the background. The defense ring is quite prominent, with an impressive entrance ramp. Still, most visitors will spent more time in the streets of the old city with its various churches, towers, shops and restaurants. I have no clue if the defense works here are significant from the military point of view, but they at least provide a splendid sight, both from the outside and as a viewing platform. 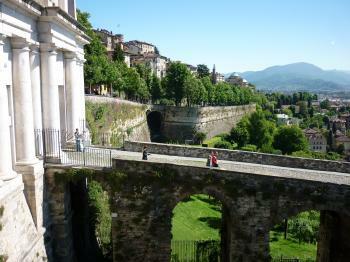 I can highly recommend a visit to Bergamo as a whole, ticking off the WHS is just the icing on the cake. Peschiere del Garda on the other hand is rather unremarkable. Most tourists come here for the access to Lake Garda. The fortifications are easily accessible and can be viewed while walking around the village core. Without any special interest in military history however, they will not capture the attention for very long. On the positive side, Peschiere del Garda is located conveniently on the train line between the WHS cities Verona, Brecia and Bergamo, and the old core can be reached by walking from the train station without a problem. I spent two hours here before proceeding, and had lots of time to spare. I'm with John on this - definitely a sleepy town. We visited in July 2015 on a whim after seeing it on roadsigns whilst killing time before our flight from Trieste to Bari. There was some debate in our car as to what Palmanova was (I was ignorant of its TWHS status): a fortified town or a shopping mall! We drove in to the centre and strolled about the piazza, stopping for coffee. It was blazing hot and there seemed hardly a sole out and about. The walls are impressive. I wish I'd attempted the perimeter walk, but I think if I had I would have passed out from sunstroke! 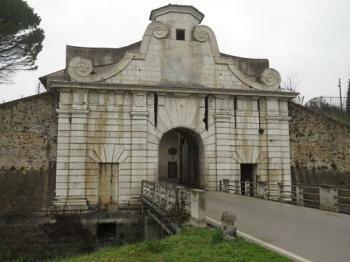 Palmanova features twice on Italy’s current Tentative List: on its own as Fortress Town of Palmanova, ánd as part of The Venetian Works of Defence. The latter is a transnational serial nomination of fortifications in Italy, Croatia and Montenegro, which is scheduled for WH listing in 2017. 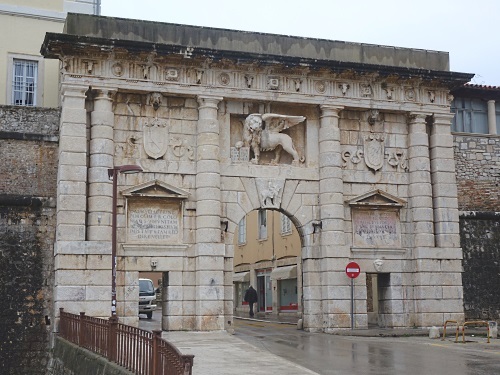 The bid strategy seems to be using the already inscribed Venice and Kotor as virtual 'bookends', to be able to pull along a string of minor sites between them such as Zadar and this small town of Palmanova. The fortress town of Palmanova was built by the Venetian Republic in 1593, in the shape of a nine-pointed star. These kind of star fortifications were fashionable in the late fifteenth and early sixteenth centuries primarily in response to the French invasion of the Italian peninsula. The French army was equipped with a new, more powerful cannon that was easily able to destroy traditional fortifications built in the Middle Ages. 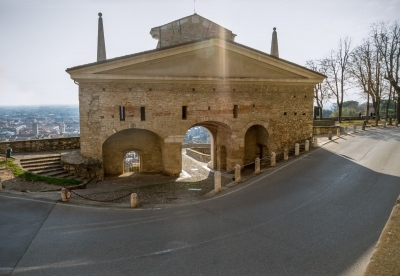 Palmanova certainly isn’t the only surviving star fortification: we have an ample connection for them already on this website. It is one of the early ones though. Admire the three city gates from both sides: they date from two different periods and vary enough in design to check them all out. Circumnavigate the town via one of the ‘Nordic walking’ trails. These footpaths are between 4 and 6.3 km in length. Each is dedicated to one of the three phases of construction of the fortifications. End up at the massive hexagonal central square. It looks made for a parade. Visit the Civic History Museum or Historical Military Museum. The Military Museum has an outdoor part too. Be aware though of the limited opening hours of both museums. During my short trip to northeastern Italy late February I arrived in Palmanova by direct bus from Aquileia, some 40 minutes south. I got off just after entering the city gate, and walked back to the ramparts. Information panels show the trails that have been created here for mountainbikers and (Nordic) walkers. I took the inner route, which would take 50 minutes to fully complete. It was a very hazy day unfortunately, only the silhouettes of the fortifications were visible. I walked one third of the trail, and then entered the town again via another gate. Passing any of the three city gates on foot is a small adventure, as the entrance is only wide enough for one car and the traffic flows steadily. So the local authorities have installed traffic lights especially for pedestrians to safely overcome this hurdle. I had a look around town and ate a pannini for lunch in a typical neighbourhood café, before walking to the railway station for the return trip. The station lies outside of the third gate, and next to an open field where one of the nine star points of the fort can be seen well. This I found the most interesting of the 3 possible approaches into Palmanova. The creation of Palmanova was a bit of a failure, historically speaking. It was built ex nihilo by the Venetians, as an ideal city that would be lovely to live in. Unfortunately no volunteer citizens came forward, so the Venetians “pardoned a number of prisoners in 1622 and gave them property in Palmanova”. And although being a fortress, Palmanova never saw a battle. Despite its apparently impenetrable defense, Palmanova was captured twice – first by Napolean and then back by the Kingdom of Italy. Unknown to me, John S. below has written almost word for word my summary of this town. Though I probably wouldn’t use the word ‘boring’, more just ‘laid back’, though I was blessed with magnificent weather on my 30 minute stop en route to Aquileia. The best way to view this town is if you are heading over on a plane (I landed at nearby Friuli Venezia Giulia Airport) which allows you to see the star shaped lay out, or you could just have a look on a satellite map. The unique lay out means that it can be a touch disorientating as all the roads look the same as they radiate from the central square to the bulky town walls. I really enjoyed my espresso in the great café next to the Duomo whilst watching the fleet of vintage Vespa’s parading around the square, and after a quick climb of the fortifications I was off on my merry way. It is a charming little place, that I can’t imagine getting inscribed on the World Heritage List on its own, but is certainly worth a brief stop for a coffee and a wander. This site is wonderful from an aerial perspective. 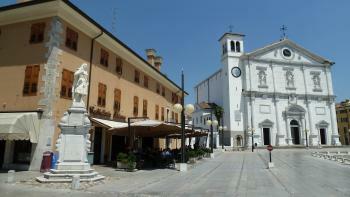 But the town is a boring sleepy town without the mystery of Sabbioneta near Mantova. A worthy thirty-minute stop towards Aquilea.